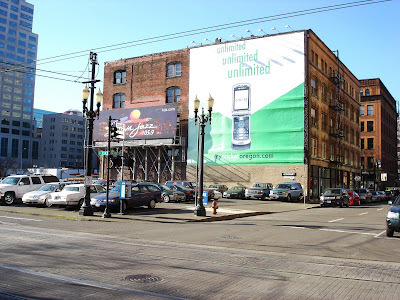 A survey of Portland’s venerable and storied parking lots could start here, at the corner of First and Stark Streets. The lot covers nearly two thirds of Block #38 (Lots #1 through #6 specifically). In land use parlance it is a “converted commercial segment.” The lot has approximately 100 spaces. It is operated by City Center Parking. Besides parking revenue, its low profile allows the side and rear walls of the Governor Building (1906) to be used as five story high billboards. It dates, like many of its kind, from the early 1950s. As often is the case, there was once something else there. From 1868 to 1954 the north east corner of Block #38 (Lot #1) was the location of the Ladd & Tilton Bank building. 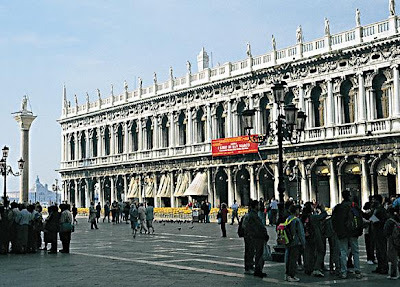 The building was designed by John Nestor, inspired by the Libreria Veccchia (1536) in Venice. It was elaborate, even in an elaborate age. Crowning the front entrance was a parapet featuring Neptune and Mercury guarding two urns. 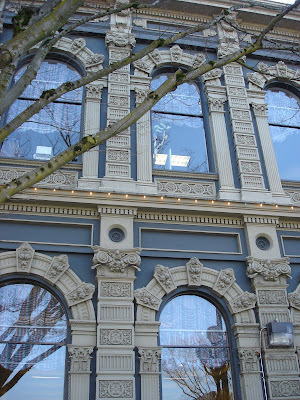 Originally the buildings cast iron facade, built by Portland’s Willamette Iron Works, was painted white to approximate marble. According to William John Hawkins III excellent and exhaustively researched book, the finials above the roofline served as chimney caps for fire place flues leading up from the building. The banks founder, William Sargent Ladd arrived in Portland from New England in 1851 with only a small consignment of liquor to sell. He set up business on Front Street, soon adding produce, tobacco, farm tools and other wares. 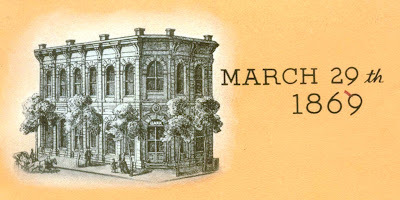 In 1853 he built the first brick building in Portland at #105 Front Street, on the corner of Front and Stark, opposite the Stark Street ferry landing. W.S, Ladd was elected Mayor of Portland in 1854. By that time he was already established as a local source of credit, loaning money at a 1% interest rate (standard for the era). If not repaid when due, he would accept payment in goods and property. He was not averse to foreclosure. From this business evolved the Ladd and Tilton Bank, established in 1859 with fellow New Englander Charles E. Tilton, of San Francisco. The original Ladd & Tilton bank operated out of the second floor (added in 1857) of W.S. 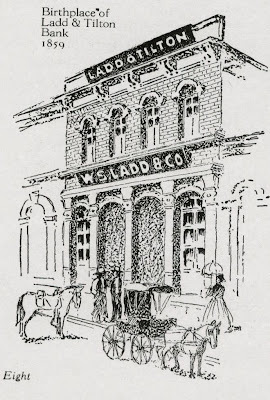 Ladd’s store on the corner of Front and Stark streets. A third story would be later added in the 1860’s. 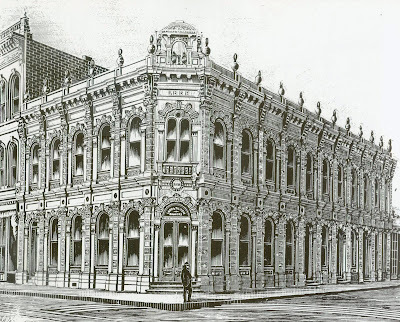 The Ladd and Tilton Bank soon outgrew the space and moved in 1864 to a temporary location before the the Ladd & Tilton Bank Building was completed in 1869. The original W.S. Ladd building was torn down in 1940. Picture from “60 Milestones of Progress, 1859 to 1919” by the Ladd and Tilton Bank. W.S. 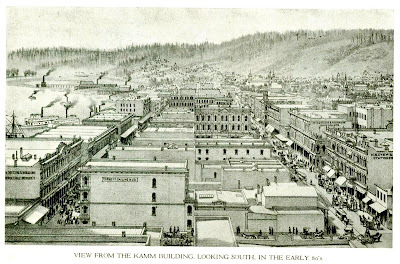 Ladd’s later career can be read as a chronicle of Portland’s development in the later nineteenth century. 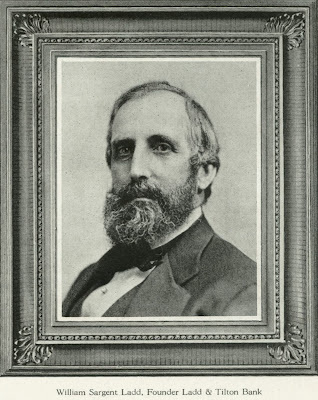 As an owner, an investor or a benefactor, he was deeply involved in interests as varied as Oregon Steam Navigation Company and its successor the Oregon Railway & Navigation Company, the Oregon Telegraph Company, the Oregon Iron & Steel Company at Oswego, the Portland Flouring Mills, the Hotel Portland, the Portland and Willamette Valley Railroad, the Portland Art Museum and the Portland Library Association (which was allowed to occupy, rent free, the second story of the Ladd & Tilton Bank from 1873 to 1893) and many others. He served on the Water Committee that decided to bring Bull Run water to Portland. He also owned three large farms on the east side of town, which were later developed as Laurelhurst, Eastmoreland and, of course, Ladd’s Addition. When William Sargent. Ladd died in 1893 his estate was worth in excess of ten million dollars. The Ladd and Tilton Bank at First and Stark. Note the street railway track, Portland’s first horse car line built in 1872. Max now runs on the same right of way. From “The Grand Era of Cast-Iron Architecture in Portland” by William John Hawkins III. 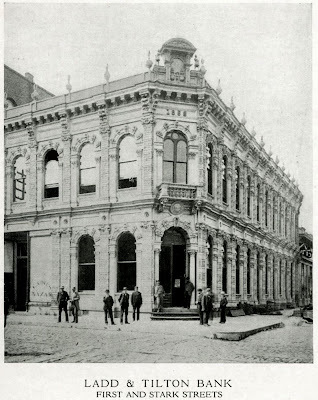 The bank occupied the location at First and Stark until 1911 when it moved to larger quarters in the Spaulding Building (still existent) at Third and Washington. The Ladd & Tilton Bank was acquired by U.S. National Bank in 1925 after being crippled by series of bad loans and investments. The banks former home on First and Stark went through a series of devolving uses until being demolished to create a parking lot in 1954. Contractor / preservationist Eric Ladd (no relation to W.S. 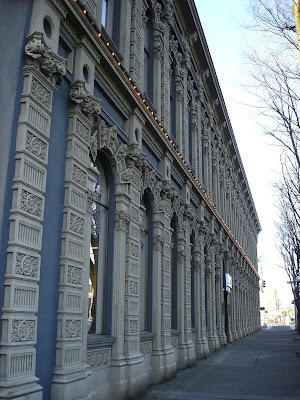 Ladd) was able to save the buildings cast iron ornamentation, which was warehoused. 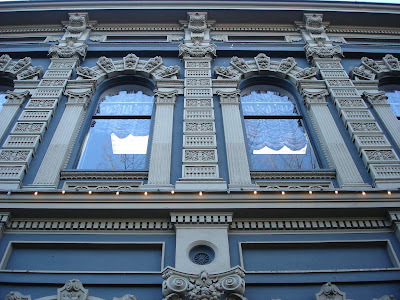 Thus one of Portland’s more extravagant buildings was consigned to memories, books and imagination. Some lost treasures are less lost than others. 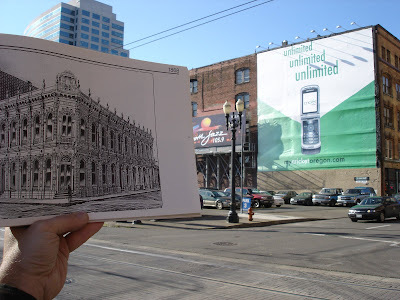 In 1869, at the same time the Ladd and Tilton Building was being built in Portland, W.S. 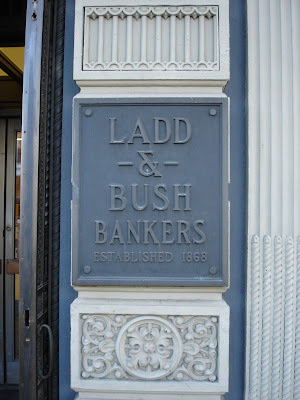 Ladd and Asahel Bush established a new bank in Salem; Ladd and Bush Bankers. 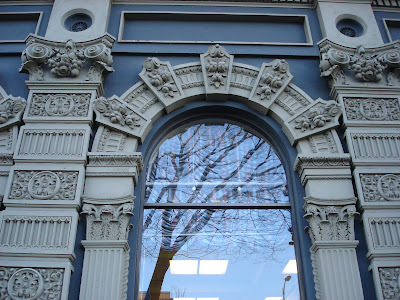 The building, on the corner of State and Commercial Streets, used identical cast iron façade pieces as the Ladd and Tilton bank in Portland, struck from the same molds at Willamette Iron Works. 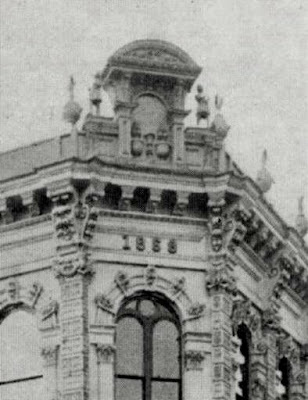 It was smaller than the Portland bank and lacked the elaborate front parapet and roof finials. Over the years the bank was enlarged and altered at least two times. In the picture above, circa 1939, there are eight bays on Commercial Street (two more than in 1869) and seven on State Street (5 more than in 1869) plus a non-matching addition at the south end of the building. 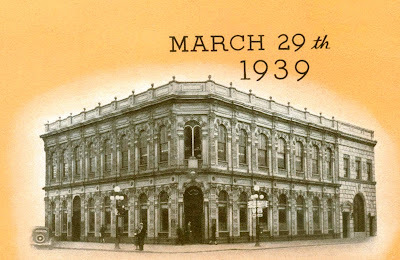 In 1940, after 71 years of successful banking, Ladd and Bush was merged into the Salem Branch of the United States National Bank of Portland. 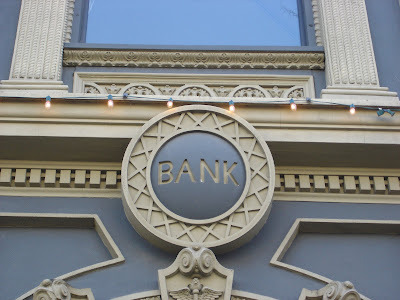 In the mid nineteen sixties, US Bank decided to expand the Salem Oregon branch. In a stunning deviation from the near standard practice of the time, US Bank chose to maintain the historic character of the Ladd and Bush bank. In 1967 the building was “radically remodeled,” according to the “Commercial Street Historic District Narrative” (this may be a euphemism) with the interior gutted and new concrete walls constructed. The original cast iron façade was then re-applied. In the expansion, the bays on Commercial Street were increased from eight to eighteen and on State Street from seven to ten. 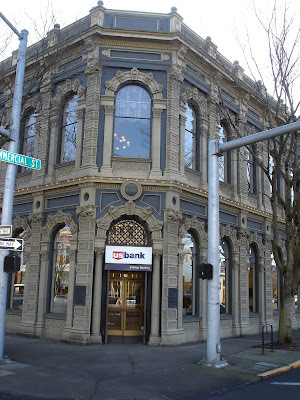 The expansion was made possible by augmenting the original cast iron facade of the Salem bank with the identical ironwork from the Ladd and Tilton Building in Portland, saved by Eric Ladd, thirteen years prior. What can be seen today on Commercial and State is a strong echo of what once stood at First and Stark. It is a hybrid of two closely related buildings that would not likely exist today without each other. The vision of US Bank and the foresight of Eric Ladd allowed Portland’s loss to be Salem’s gain. The Ladd banks had a tendency to publish books before disappearing. “Sixty Milestones of Progress” was published in 1919, six years before Ladd and Tilton was acquired by U.S. National Bank. “70 Years” was published in 1939, a year before Ladd and Bush was merged into U.S. National Bank. 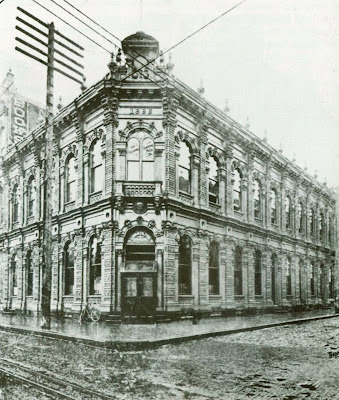 In “The Grand Era of Cast-Iron Architecture in Portland” William John Hawkins III mentions that a near twin to the Ladd & Tilton Building was also built in 1868, the Ironclad Bank of Brooklyn New York. Does this building still exist? 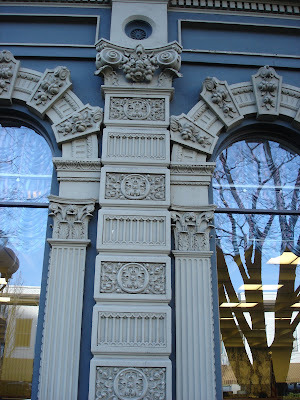 Eric Ladd’s salvaged cast iron pieces adorn the Ladd & Bush building in Salem. But what happened to the parapet with Mercury and Neptune? A copy of “The Grand Era of Cast-Iron Architecture in Portland” is good to have around. Another reason to love the Goodman family. NOT! Dan, what is your e-mail address? Great stuff, Dan! I really enjoy your blog. Keep up the good work. Funny, I didn't know anything about Ladd's bank. Like most Portlanders, I'm more familiar with his neighborhood: Ladd's Addition. You're breaking heart with all of these lost and found features. Great work. Very interesting. My great-grandfather was the Tilton of Ladd & Tilton, Ladd was one of his best friends from school in New Hampshire. Always like to see info related to my family history. Great work.Thanx for such an effort. Great work.Good looking outside.Gorgeous this web page will be famous amid all blogging users, due to it’s fastidious content and article.